It's quite hard to maintain anonymity on the Internet using the slow Tor network. Or is it? Well, it turns out, you may soon boost your online anonymity dramatically with the help of a new high-speed anonymity network. A group of six academics have developed a Tor network alternative for users that allows high-speed anonymous web surfing, reinforcing the privacy of Internet users worldwide. Many anonymising networks, including The Onion Router (or TOR) network, are often slow because the data passing through the networks is encrypted a many numbers of times. However, the high-speed onion routing network HORNET is capable of handling anonymous traffic at speeds of more than 93 Gbps while maintaining privacy. 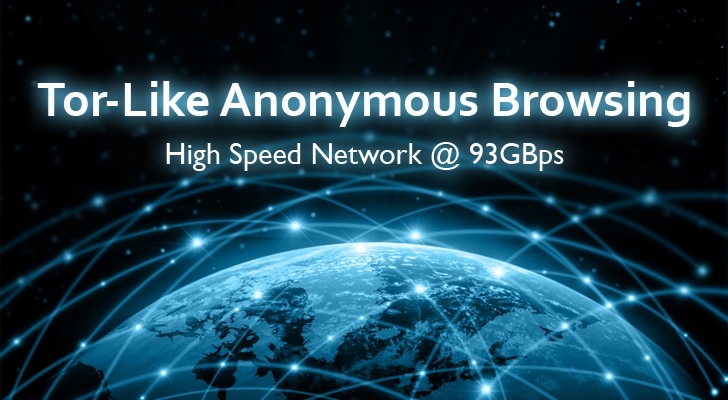 The new anonymous network is built by researcher Chen Chen of Carnegie Mellon University, along with Daniele Enrico Asoni, Adrian Perrig and David Barrera of the Zurich's Federal Institute of Technology, and George Danezis of University College London. The security researchers' ultimate goal is "Internet-scale anonymity." In a paper (PDF) titled HORNET: High-speed Onion Routing at the Network Layer, the team says Hornet is a low-latency onion routing system that enables end-to-end anonymous channels with a quicker and more secure alternative to Tor. Tor network, which handles over 2 Million user on its network daily, is currently used by journalists, activists, law enforcement and hackers to disguise from where they are browsing the Internet. However, Tor has its faults. It is often slow and frustrating because its performance is based on the number of systems that make up the network. HORNET aims to resolve this issue. "[HORNET] is designed to be highly efficient," reads the paper, "instead of keeping state at each relay, connection state (such as onion layer decryption keys) is carried within packet headers, allowing intermediate nodes to quickly forward traffic for large numbers of clients." Researchers say that unlike TOR-like systems, HORNET does not keep per-session states or "perform computationally expensive operations for data forwarding," allowing it to scale as required without any limitations. Moreover, the changes done by the team made HORNET less susceptible to confirmation attacks that have been used to unmask users of Tor by monitoring traffic streams and packet flows. HORNET raises the security bar since spy agencies or hackers would need to control "a significant percentage of ISPs" across multiple geopolitical areas, while keeping their whole surveillance operation quiet and spying on HORNET's users effectively. The new Tor-Style networks could be of great help to users who are currently relying on Tor and other onion routing systems. You can download the paper PDF for full technical details on HORNET.